We offer a handy plugin, List Subscribe for WordPress, to help you add a Mailchimp signup form widget to your WordPress site. Install the plugin to design a beautiful signup form that syncs to your Mailchimp list. As with most plugins, you can choose to disconnect at any time. In this article, you'll learn how to connect or disconnect the List Subscribe for Wordpress plugin. First, generate an API Key in Mailchimp so you can connect the plugin. This process is managed in your WordPress Admin panel. Learn how to find your Admin Panel. This plugin creates a form widget that works with wordpress.org sites only. To find out what options are available on wordpress.com sites, check out other signup form options. Optional advanced installation: If you have a custom-coded sidebar or another WordPress feature that disables widgets, learn how to install the plugin's shortcode. When subscribers sign up via the signup form widget on your WordPress site, we'll pass their data to your Mailchimp list, including email address, name, and any other list field or group info that you want to collect. To connect this plugin, you'll complete a three-part process: add the plugin to your WordPress Admin Panel, customize your signup form, and drag the Mailchimp Form Widget to your site. To add the List Subscribe for WordPress plugin, follow these steps. In the left navigation panel, click Plugins, and choose Add New. Search or scroll to locate the Mailchimp List Subscribe Form, and click Install Now. Now that the plugin is activated, you've got a few more steps to go: customize your signup form, and place the form widget. To connect to Mailchimp and customize your signup form, follow these steps. On the Plugins page, click Settings under Mailchimp. Paste your Mailchimp API key into the field, and click Connect. To complete this part of the process, you'll need a Mailchimp API Key. Find out how to generate a new key in About API Keys. Click the Select A List drop-down menu, and choose which Mailchimp list to connect to. In the provided sections on the Setup page, customize your form settings. Content Options: Customize the text of your form's header, subheader, and submit button. Remove CSS : Disable Mailchimp's CSS (advanced option). Custom Styling: Edit the border, color, and text of your form. Merge Fields Included : Choose to show or hide certain Mailchimp fields from your signup form. Group Settings : Show or hide Mailchimp group options. After you update each section on this page, click Update Subscribe Form Settings. Your signup form is now customized, and you're almost done! After you customize your form, we'll add a Mailchimp Widget to the Appearance section of your Admin Panel. Decide where you want the form widget to appear, and drag and drop it to your site. You'll only need to do this once. To place your form widget, follow these steps. In the left sidebar, navigate to Appearance, and click Widgets. Drag the Mailchimp Widget into one of your widget areas, like your sidebar or footer, and click Save. You're all set! Now your WordPress visitors can sign up for your Mailchimp newsletter. If you ever need to disconnect the plugin, you can do it anytime. Disconnecting removes any Mailchimp form widgets from your site, but does not affect your Mailchimp list or subscriber data. To disconnect List Subscribe for WordPress, follow these steps. Navigate to Plugins, and click Installed Plugins. Search or scroll to locate Mailchimp, and click Deactivate. After the page refreshes, search or scroll to locate Mailchimp, and click Delete. On the Delete Plugin page, click Yes, delete these files. The List Subscribe for WordPress plugin has now been removed. If you want to try another type of form, read about all the options available for Mailchimp signup forms. Different signup forms can help you win subscribers from different audiences. 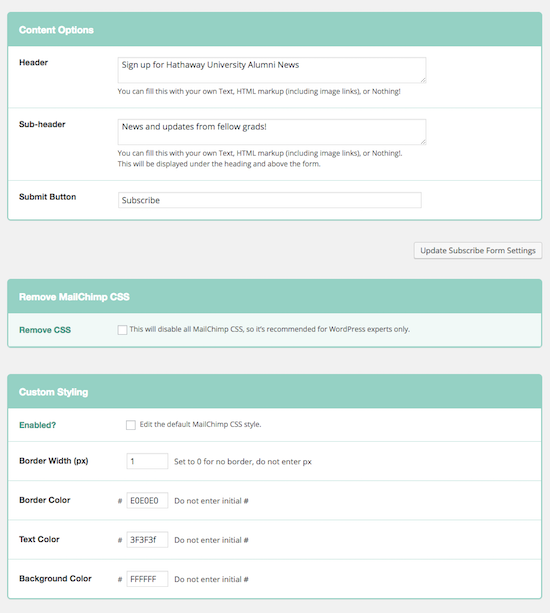 Learn about Mailchimp's signup form options and choose the best type for you.